2. Most likely not a netting over a silk cap — while some look like they could be netting, most do not. Netting would pull and push the fabric underneath it in a specific way. 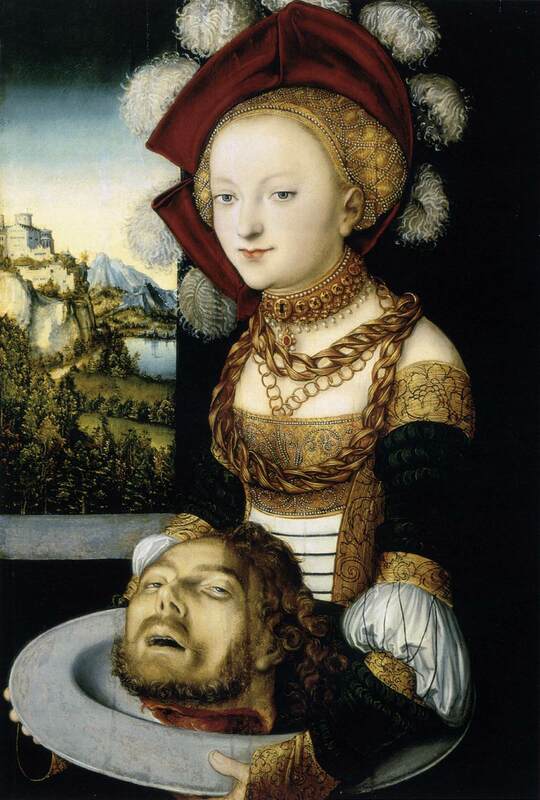 You can see that the goldhaube in Cranach’s painting of the Beheading of Salome has a slight fold on the side, and this would not occur if it was netting over fabric. 4. 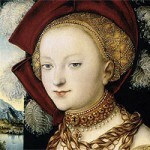 All of these hauben accommodate the “braid bulge” on the side of the head without obvious straining. I plan to make more muslins of different shapes and experiment with them. But if anyone out there knows — or has theories on — how these hauben were constructed to show no gathers/folds and yet have a tight band and accommodate the braids, please let me know! I have the special order orange/gold silk in, I have my vintage fresh water pearls ready, I have my slate frame ready to go — but I don’t have the right shape yet! If you have any ideas, PLEASE reply to this post or e-mail me at genoveva.von.lubeck [at) gmail.com. Thanks! Can you suggest a good source of fabric for a goldhaube? I am looking for something other than Duponi.